The Pennsylvania Sea Grant College Program encourages educators to apply for the “Teacher at Sea Program,” offered by the National Oceanic and Atmospheric Administration (NOAA). The Teacher at Sea Program is an opportunity to engage in ocean research alongside NOAA research scientists and other teachers from around the country. The Teacher at Sea Program has accepted nearly 700 teachers, representing all 50 states, into the program since it began in 1990. Five Pennsylvania teachers have participated, including Mark Wolfgang, who teaches Biology and Zoology at Franklin Regional High School in Murrysville, PA. In April 2017, he joined NOAA scientists aboard the research vessel the Reuben Lasker, to conduct a spring survey of the organisms living off the coast of California, with specific emphasis on the anchovy and sardine populations. 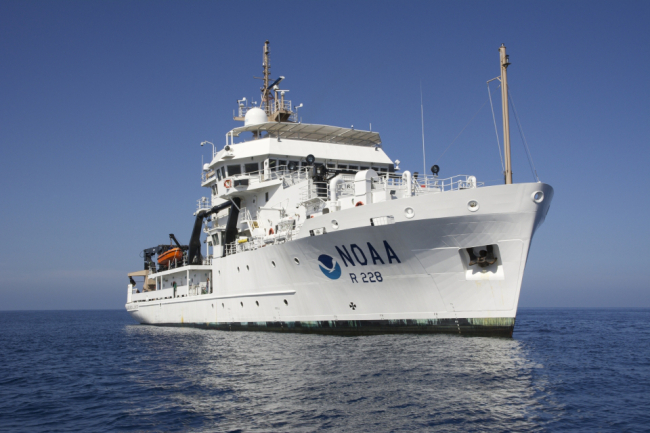 The NOAA Ship Reuben Lasker is one of the most technologically advanced fishery survey vessels in the world. The ship’s primary objective is to support fish, marine mammal, seabird and turtle surveys off the U.S. West Coast and in the eastern tropical Pacific Ocean. The April 2017 survey focused on anchovies and sardines, but unfortunately, only very few sardines and anchovies were found during the spring survey. Researchers are studying the irregular population fluctuations, and learning from the data. Sardines play an important role in the ocean ecosystem and food web, and low numbers in these populations can affect the other organisms that live in this ecosystem. NOAA also serves as an important bridge between science and education. One of the goals of the Teacher at Sea Program is an increased understanding of how NOAA research is linked to the Next Generation Science Standards and Ocean Literacy Principles, and pathways leading to NOAA careers. Applicants may be classroom teachers (Pre-K through grade 12, community college, college or university), aquarium or museum educators, or adult education teachers. 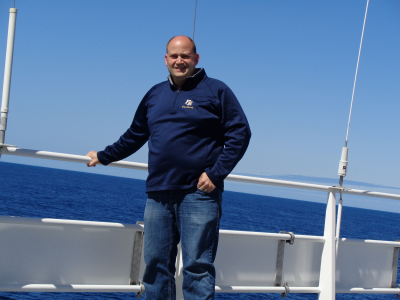 Teacher at Sea participants are typically on board one of NOAA’s research vessels for approximately two weeks and may participate in one of three cruise types: fisheries research, oceanographic research, or hydrographic surveys. Participants can expect to be at sea anywhere from two weeks to one month, with the average cruise lasting 12-14 days. Most participants sail on cruises offered during the summer vacation, but cruises take place throughout much of the year on a space-available basis. Guidance on how to apply and program FAQs are available on the Teacher at Sea website.